Bruce deGrazia has been a lawyer since 1984, when he began his career in the U.S. Navy, serving as a prosecutor and an advisor to the Commander, Naval Surface Force Atlantic Fleet. He then worked for Burditt, Bowles and Radius in Chicago, specializing in environmental litigation and international business law. From 1990-1997 he was in-house attorney for Cummins Engine Company and United Technologies. 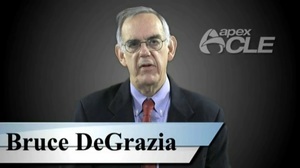 In 1997, Mr. deGrazia was appointed to be Assistant Deputy Under Secretary of Defense for Environmental Quality, in which position he was responsible for Defense Department policy in the areas of environmental compliance, conservation, pollution prevention, cultural resources, and American Indian issues. While there he supported the Vieques Commission in their determination that the Navy should find an alternative training area than the island of Vieques, near Puerto Rico. He also worked on the projects to raise the CSS Hunley and U.S.S. Monito After the Clinton Administration, he became Deputy General Counsel at Versar, an environmental and engineering company, where he saved the company over a million dollars in an environmental remediation case. In 2003 he joined Aitken Berlin.